From the Old Town Square take Dlouha Street. Turn left into Dusni Street. Walk straight ahead, cross over the roundabout, and continue through the passage between the church and the statue. Hangar Bar is on the left-hand side. Hangar Bar in Prague is an aviation themed bar/club in the 'cocktail quarter' of the Old Town (Dlouha/Dusni streets), a few minutes walk from the Old Town Square. Hangar Bar aims to recreate the exhilaration of early aviation. On the upper-floor is the Pilot’s Lounge, inspired by the fun and style of flying Pan Am in the 1940s-70s. Hostesses in Pan Am uniforms greet you and serve you drinks. 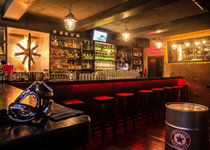 Downstairs is the Hangar Club, designed in the theme of a den for reckless stunt and military pilots. The dance floor is here too (with shocking manoeuvres on display every night!). The drinks are very reasonably priced for downtown Prague; there are a good range of beers, wines and spirits to choose from, but the star performers are the cocktails - pure works of art. Take a seat at the bar and watch the bartenders indulge their passion for mixology. Hangar Bar is a relaxed place to drop in for a drink early on. Then, as the night progresses the atmosphere rises considerably, particularly down in the Hangar Club. On busy nights the flair bartenders even put on fire shows. Hangar attracts a good mix of Czechs and tourists. The music is mainstream rock, pop and dance tunes from the 70s/80s/90s/00s/10s. A DJ plays at weekends, when it is open until 6am. Hangar Bar is located two doors along from its sister bar, Aloha Bar, Club & Café.